The WebCC server service allows people to connect to the Harmony database using a web browser, to export scenes, work on them using Harmony Stand Alone, then upload their changes back to the database. 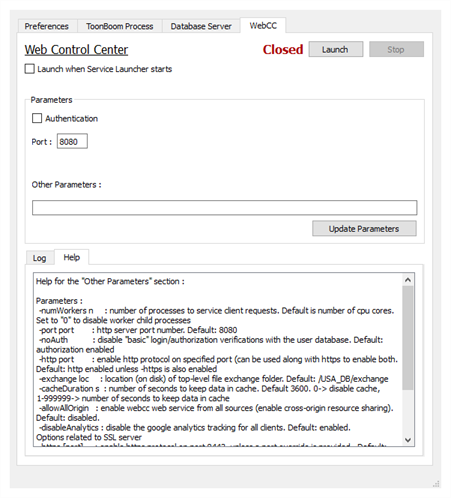 Launch when Service Launcher starts Check this option to automatically launch the WebCC service when the Service Launcher is launched. This bypasses the need to click on the Launch button. Check this option to display the Login screen when users connect to WebCC. Users must have a valid username and password. 8080 is the default port number for connection. If it was modified, you can enter your custom port number in its place. Help tab This tab lists all the available options for the WebCC server.You can type these parameters in the Other Parameters field to customize the behaviour of the service.